These companies are gobbling up their own shares. One thing that successful companies like to do with their excess cash is to buy back their own shares in what are commonly referred to as "share-repurchase" or "stock-buyback" programs. These programs come in all different flavors. 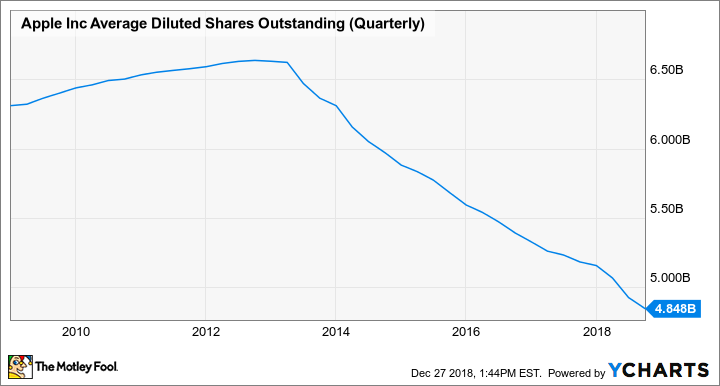 Some are extremely aggressive and lead to significant declines in a company's outstanding share count -- something that boosts a company's earnings per share (EPS) in a material way. Others are done merely to offset the dilution in a company's outstanding share count that occurs as a result of things like share-based compensation. 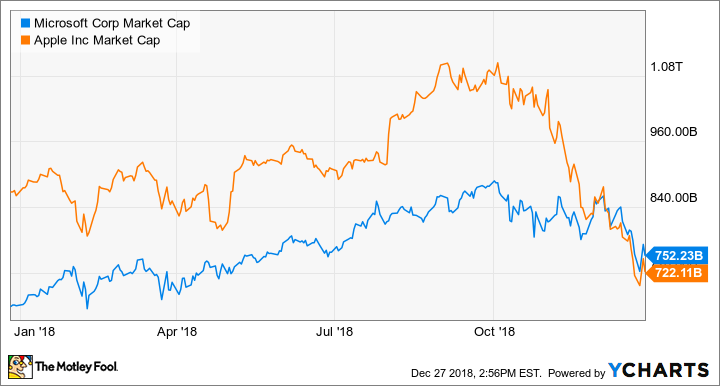 I'd like to highlight three large tech companies that have large share-repurchase programs in place and have been actively executing on them: Apple (NASDAQ:AAPL), Microsoft (NASDAQ:MSFT), and Micron (NASDAQ:MU). Apple, the maker of popular products like the iPhone, iPad, and Mac, really likes to buy back its own stock. 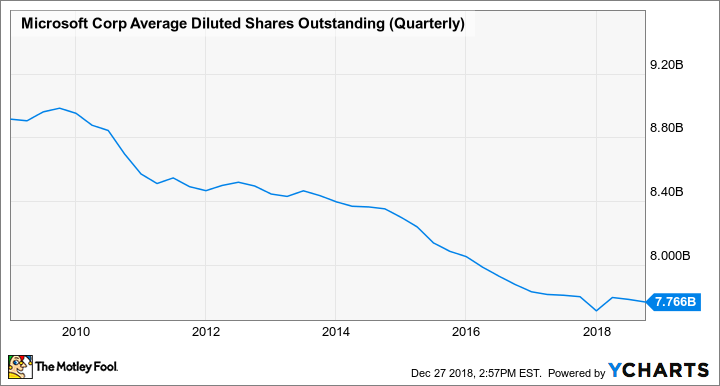 As you can see in the chart below, Apple's aggressive repurchase activity has led to a dramatic reduction in the number of shares that it has outstanding. AAPL Average Diluted Shares Outstanding (Quarterly) data by YCharts. Because of the company's consistent dedication to buying back its own stock, whenever it reports earnings results, its EPS is materially higher than it would've been otherwise, since EPS is calculated by dividing a company's net income (that's after-tax profit) by the number of shares outstanding. The smaller the number of shares outstanding, the bigger the EPS. Apple's not done, either. According to the company's most recent annual filing, out of the $100 billion that its board of directors authorized back in May for share repurchases, only $29 billion had been used up as of Sept. 29, 2018, leaving $71 billion left in the program. Given Apple's recent -- and significant -- share-price decline, I wouldn't be surprised if the company took the opportunity to more aggressively execute on that program. Microsoft recently displaced Apple as the most valuable publicly traded technology company in the world. Like Apple, Microsoft has spent -- and continues to spend -- considerably to buy back its own shares, although Apple's pace of share repurchases over the years has been far more vigorous. MSFT Average Diluted Shares Outstanding (Quarterly) data by YCharts. Looking ahead, Microsoft's board of directors greenlighted a $40 billion share-repurchase program back on Sept. 20, 2016. According to the company's most recent quarterly filing, the company still had $25.6 billion left on that program as of Sept. 30, 2018 -- meaning that over the span of two years, it only bought back $14.4 billion worth of stock. I look forward to seeing if Microsoft steps up the pace of its buyback program in the coming quarters or if it's content with the more gradual approach that it's taking. Earlier this year, memory specialist Micron announced a share-repurchase program good for $10 billion. While that's not quite in the same ballpark as Microsoft's $40 billion buyback, let alone Apple's enormous $100 billion share-repurchase authorization, the size of a buyback needs to be considered in the context of a company's market capitalization. Microsoft's and Apple's market capitalizations are each north of $700 billion, while Micron's is currently around $35 billion. Last quarter, Micron scooped up $1.8 billion worth of its own shares, meaning that there's still $8.2 billion left on the company's current buyback program. If Micron is able to grab the shares at roughly where the stock is currently trading, it should be able to retire almost 24% of its currently outstanding share count with the remainder of its share-repurchase authorization. Even taking into account the dilution that Micron will inevitably see from share-based compensation, if Micron can get that remaining $8.2 billion deployed to buy back shares relatively quickly, it should be able to enjoy meaningfully higher EPS as a result of those repurchases.